The auditorium was packed. More than 100 people sat and prepared themselves for a presentation of the new strategy. The leadership team had worked on it for months, with support from a few consultants. Now it was show time. There was a beautiful 24 page strategy report for each participant. The report contained some text, and a big metaphoric picture. All the essential elements of the strategy were in this picture. The CEO went on stage. With great enthusiasm he started his story. To his left there was a big picture, covered with red cloth. After the first few slides, he removed the red cloth. A and big picture with space ships, astronauts and planets emerged. Three months later, all that had participated in the presentation remembered the picture. All remembered the two strategic goals. Most participants recalled all the strategic objectives. And many were involved in carrying out the strategic actions. The auditorium was packed. More than 100 people sat and prepared themselves for a presentation of the new strategy. A big management consultancy had worked on it for months, with input from the leadership team. Now it was show time. There was a nice 100+ page strategy report for each participant. The report was dense with text, figures and graphs, and photos of happy and dedicated people. The CEO went on stage. 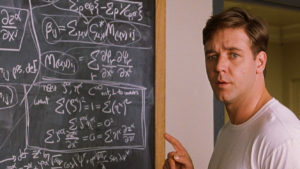 With great enthusiasm, he went through the 80 slides, which was a condensate of the strategy. The presentation went on and on, for more than one hour. Bullet points, tables, graphs. Once in a while a photo of happy and dedicated people. There was of course a Q&A session in the end, with a few polite questions. Then everybody toasted in champagne, and went on with their day. Three months later, a concerned leadership team met to discuss the strategy. Most had forgotten about the presentation, and nobody seemed to care about implementation. Which of these two stories is most common? And which of these scenarios is most desirable? I can tell you, I have experienced both. And I am not in doubt. The Beautiful Picture scenario appeals much more to me than the Death by PowerPoint scenario. Unfortunately, the latter is far more common. Daniel Kahneman earned the Nobel Price for his work on decision biases. His work has won popular acclaim in his bestseller “Thinking Fast and Slow“. 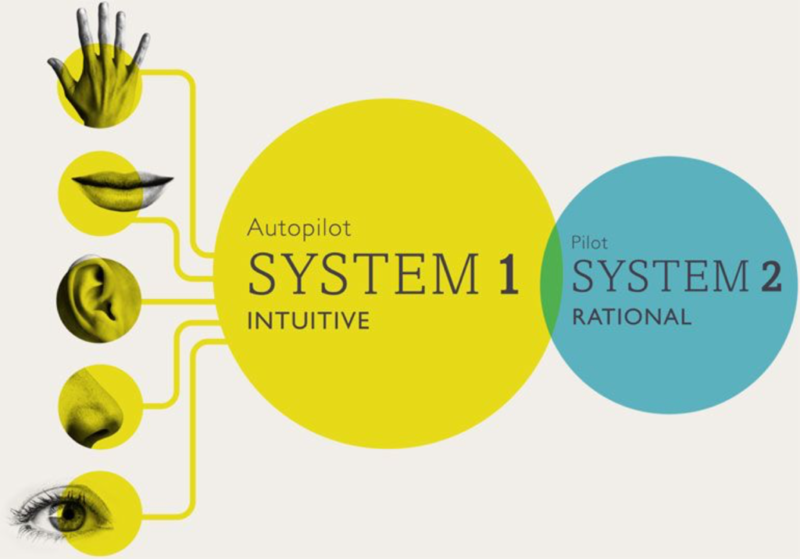 One of the main thoughts in his work is the concept of two thinking systems, System 1 and System 2. System 1 operates fast, and is what we use everyday. System 2 operates slowly and requires more effort. We use System 2, when we engage in more complicated thinking activities. What has this to do with Strategy? The thing is, that we use System 2 in most strategy work, at least in the creation of the strategy. Lots of text, tables and figures. Long and brainy discussions in leadership teams. 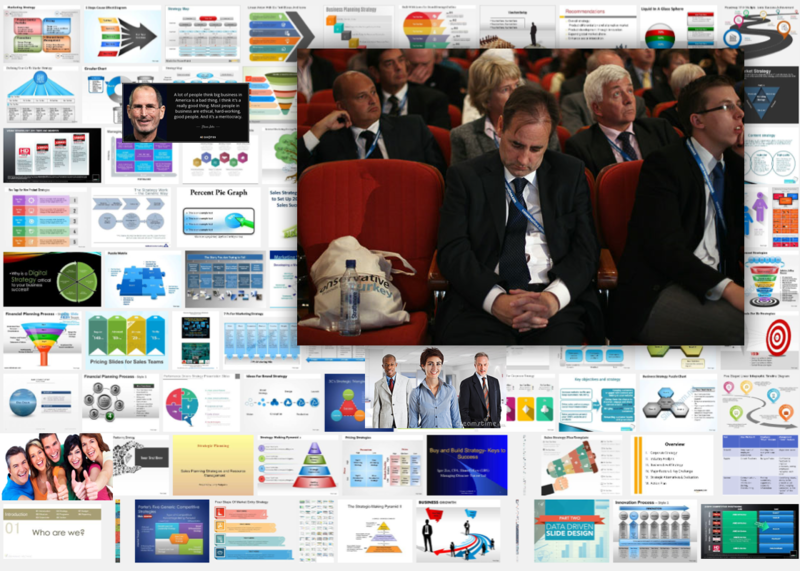 Tons of Powerpoint slides. Endless analysis and calculations. SWOT analysis, Business Model Canvas, Blue Ocean Strategy, Porters Five Forces etc. All this is good, and also necessary. Strategy is complicated, and even complex. 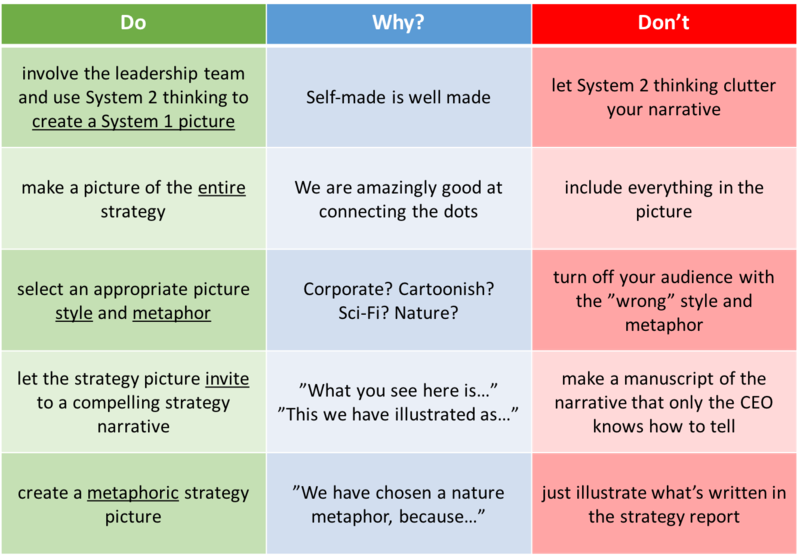 Most companies actually don’t find it problematic to create the strategy, since System 2 thinking is the preferred “rational business” mode of operation. The Most Difficult Part of Strategy is Implementation. And implementation has a lot to do with communication. 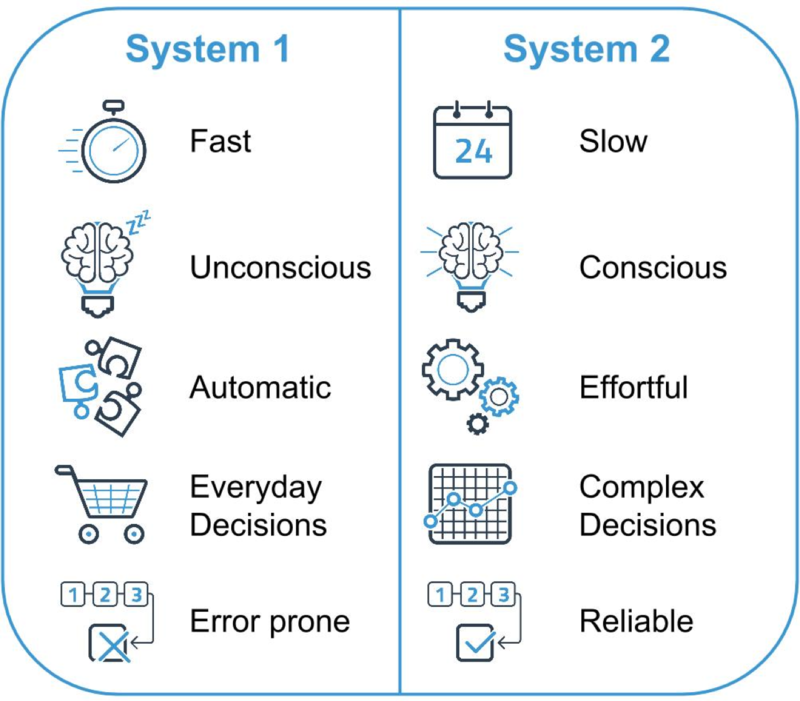 If you use System 2 Thinking to communicate your strategy, it will have System 2 characteristics: It will be reliable, but slow, deliberate, and difficult to grasp due to its complexity. 22,3 x 17,26 = ? This is exactly where a visual strategy description has its force. A visual strategy is not a collection of the visual elements in the strategy document. So it is not a collection of grids, tables and figures. Or the action plan. It is a System 1 representation of System 2 material, and hence a lot more easy and quick to grasp. A visual strategy is a metaphoric description of the most important elements of the strategy. It is a picture that includes the present state as well as the desired future state. It is a picture each employee can see himself or herself in. It is a picture that supports the narrative of the strategy, vision, and the most important strategic priorities. It is a picture that evokes curiosity, pride, and a sense of belonging. Oftentimes, the System 2 deliberate and slow strategy formulation is done in conjunction with the creation of the strategy picture. Mind you, the creation of the picture is also a System 2 process, in the sense that it must be an accurate depiction of the strategy. But the result will appeal to System 1, meaning that it can be grasped quickly by the audience. And this is the true strength of it: With a compelling spot-on metaphoric picture, the narrative flows easily. Also, it is holistic – you can start your exploration anywhere in the picture. A strategy document or slide deck will be linear in its structure. If you have some System 2 information that you need to communicate and implement, consider making it visual. You may read a small case story more on visual strategies in one of our previous blog posts. 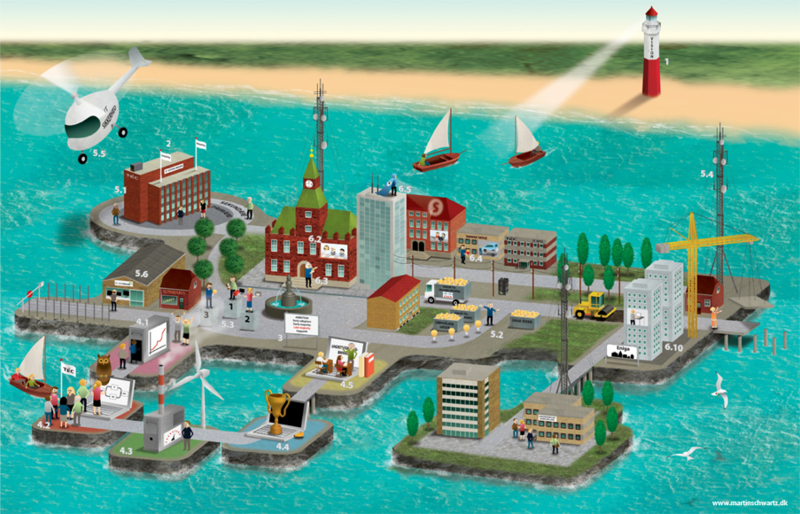 You will also find more information on visual strategies (in Danish) here.